As tempting as it is to see the start of a new year as a fresh beginning – an opportunity to forge ahead with new resolutions, new plans and exciting new initiatives – it’s also important to take a look back. To consider all that the utility and asset management industries have shouldered during 2016, so that we can take stock and consider our priorities and strategies as we step into 2017. 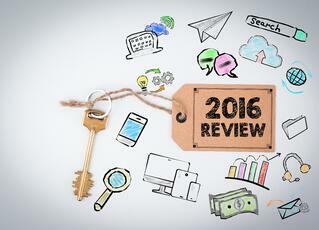 To begin, let’s take a look back at our own predictions for what 2016 would hold – including a greater emphasis on network security (which hasn't reached its tipping point yet, but may soon with the rapid realization of the Internet of Things); the continued expansion of fiber (if only we could have foreseen the impact of Google Fiber and the “One Touch Make Ready” ordinances that overtook headlines throughout the summer and fall); and the anticipated publications of the NESC’s 2017 revision, which was released in August. The power of cloud computing to seamlessly deliver access to the information you need, when you need it – whether you’re at your desk, in the field, at home, or on the road – isn’t new for 2016, but it continued to dominate headlines and technology releases. So what did the cloud mean for joint use last year? For geographically distributed businesses like asset management and joint use, the cloud has enabled anywhere, anytime, any device access to the vital information you need to do your job. Simple search functionality allows you to quickly scan decades of contracts to find the one you need, or determine the state of equipment in the field by cross-referencing recent maintenance and field inspection records. Up-to-the-minute data and information enables more timely and valuable decision-making. As technology advancements goes, the cloud is pretty impressive. But it pales in comparison to the equally confusing and overwhelming concept of the IoT. What? The Internet of Things? “What things?”, you might ask. We’re going to side-step that tricky question by pointing you to others who are much more qualified to explain this complex topic than we are. What we will say is that the IoT was just in its infancy for our industry in 2016, and there is so much more to come. Someday soon, machines will regularly communicate with each other without relying on us to interpret and transmit messages or demands. While this doesn’t mean that robots are going to take over the world (we hope), it does mean that field work will become more efficient when field equipment is capable of self-diagnosis and self-reporting. As expansion efforts propel providers to new areas and into emerging technologies to reach new customers, underground vaults experienced a surge in popularity in 2016. As Google and other providers raced to deploy as fast and as far as possible, the amount of free conduit space is limited and is filling up fast. This created a premium on conduit space, and tough competition for any available space. Owning and operating field assets has always been the means to an end. Poles, conduit and tower were necessary evils required to deliver the providers’ primary offerings. But in 2016, we saw this mindset begin to change. New ideas and strategies have started to establish field assets as a business unto themselves – with defined profit and loss centers, and revenue expectations. The industry still has a long way to go to maximize field asset management as a moneymaker, but we’re willing to bet we’ll see even more of this in 2017. The past year was a big one for our industry. It set the wheels in motion for a period of intense change and growth – which is both exciting and unnerving. We’ll keep using this blog to address what we see happening in the industry. Please let us know what you think, and how we can help you make the most of your field asset business. Did we miss any major industry news or trends from 2016? Add your thoughts in the comments. The joint use industry is entering a new era of modernization. Find out what to expect. Download our free eBook: Joint Use Asset Management for the 21st Century.